SEATTLE (AP) — Andrew Whitworth was sitting on the bench with his helmet on the ground. Jared Goff was busy in conversation with referee Clete Blakeman about a previous play. Initially, the Los Angeles Rams believed coach Sean McVay would take the safe play and punt rather than the risk of going for it on fourth down with less than 2 minutes remaining inside Rams territory. That’s not the style of McVay, or these still unbeaten Rams. “We knew we were going to get it,” running back Todd Gurley said. “That offense has (guts) and we’re riding behind them,” defensive end Michael Brockers said. Cairo Santos atoned for a missed extra point with a 39-yard field goal with 6:05 remaining to give the Rams a 33-31 lead, capping a 61-yard drive that took 4½ minutes. That still left time for Wilson, but Seattle (2-3) made a pair of critical mistakes after moving into position to win. Wilson hit Tyler Lockett for 44 yards on the second play of the drive to the Rams’ 32-yard line. 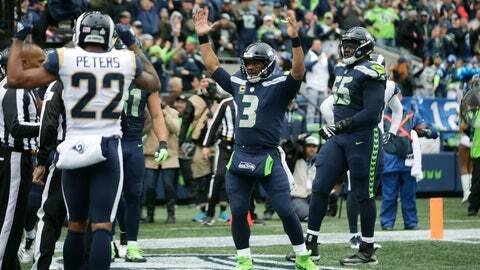 But a pair of penalties backed up the Seahawks to the Rams’ 45. Facing third-and-23, Wilson was pressured from the pocket by Cory Littleton and Seattle punted with 3:38 left. “It was all riding on that one play and we got a really, really good jump on them up front,” Goff said. “You need to know that when these games come around, can you finish. That’s what we did today,” Gurley said. Wilson threw for three touchdowns and Seattle had a running back top 100 yards rushing for a third straight game as Chris Carson rumbled for 116 yards. The running game was the foundation for all of Wilson’s success through the air as Seattle finished with 190 yards on the ground, including 68 yards and a touchdown from Mike Davis. Cooks was hurt late in the second quarter when he was hit by Tedric Thompson as he came across the field. Most of the hit was with Thompson’s shoulder, but there was some helmet-to-helmet impact and Cooks appeared to be immediately knocked out. He jogged off the field on his own but was ruled out early in the second half. Thompson tackled Gurley at the 1-yard line in the second quarter that ended up saving the Seahawks four points when Gurley was stuffed on third-and-goal and the Rams settled for a 19-yard field goal by Santos. And he intercepted Goff’s desperation throw to end the first half. But he also whiffed on a trio of plays, including Woods on a 31-yard slant route, Kupp on his TD reception and Woods on a 56-yard fly sweep late in the third quarter.